To Cite: Mirzakouchaki B, Faraji R, Rahbar M, Shirvani H. Determination of Specific Anatomic Locations by SIFT Algorithm for Locating Cephalometric Points with the Use of an Automatic Technique, Iran J Ortho. 2017 ; 12(2):e7676. doi: 10.5812/ijo.7676. Background: Lateral cephalometry is very important for the evaluation of growth, diagnosis, treatment planning and therapeutic evaluations. Considering the advantages of lateral cephalometric analyses with the automatic technique and given the existing problems, the present study was undertaken to use a new automatic technique for determination of cephalometric landmarks. Aim: The aim of the present study was to determine the specific anatomic area by SIFT algorithm for locating cephalometric points using an automatic technique. Methods: In this study, 110 digital lateral cephalograms were randomly selected and pre-processing was carried out on the images. Three orthodontics used these cephalograms to manually select 11 cephalometric landmarks (point A, point B, PNS, ANS, Po, Or, N, Ar, Me, Gn and Pog) on a software program which had been designed to this end. The coordinates of the selected points were saved in the database for the corresponding process of the images. After completing the software program with these data, 30 new radiographs were submitted to the software program for anatomic determination of the points. SIFT algorithm was used in the software program for the anatomic identification of the landmarks. To make a comparison, these 30 cephalograms were manually analyzed by three orthodontists in order to evaluate the accuracy of the software program at various points. Paired t-teat was used to compare the manual and computerized techniques. Statistical significance was set at P<0.05. Results: Based on the results, the differences between the manual and automatic methods in determining cephalometric landmarks were < 1 mm in 46% of cases, < 1.5 mm in 82% of cases and < 2 mm in 100% of cases. In addition, there were no significant difference between the two method except for points Or, Po and PNS (P > 0.05). Conclusions: It was concluded that the designed algorithm had good performance for easy and relatively difficult points. In relation to very difficult points, too, it exhibited rather acceptable performance and located the points better than other algorithms. Copyright © 2017, Iranian Journal of Orthodontics. This is an open-access article distributed under the terms of the Creative Commons Attribution-NonCommercial 4.0 International License (http://creativecommons.org/licenses/by-nc/4.0/) which permits copy and redistribute the material just in noncommercial usages, provided the original work is properly cited. Cephalometry or measurement of the head, as an anthropologic technique for determining the shape and size of the skull, was developed by Broad Bent in 1931 (1). Lateral cephalometry is an important technique for the evaluation of growth, diagnosis, treatment planning and therapeutic evaluations (2). Three techniques are available for lateral cephalometry: manual technique, computer-aided technique and automatic technique (3, 4). In the automatic technique, digital or scanned radiographs are saved on a computer and a software program determines the points and carries out measurements automatically. 1) Edge-based or knowledge-based technique which consists of pre-processing and edge detecting steps plus the use of an algorithm to determine the landmarks (5). 2) Model-based approached (template matching, pattern matching): In this technique, a geometric algorithm or template is used to directly determine the points. The main disadvantage of the systems that only use a one-step pattern to determine the points is the fact that an error in determining the points at a long distance from the expected landmark can strongly decrease the accuracy of the system (5-7). 3) Hybrid approach: In this approach a combination of the two techniques mentioned above is used to determine the points. Despite an improvement in the accuracy of determining the points, the accuracy of this technique in the clinic is still less than that of the manual techniques (2). Studies that have used the edge-based technique consist of studies by Cohen in 1984 (mean error = 2.06) and Ren in 1998 (of 24 points that were evaluated, 19 points were identified with an error of 1 mm and 5 points could not be indentified). The mean error in all these studies was higher than that in manual techniques and a number of landmarks could not be identified (8, 9). Studies that have used the model-based technique consist of studies by Saad in 2005, Reomaniuk in 2004 and Rudolph in 1998 (mean error = 3.07 mm). Although better results were achieved compared to the technique above, the accuracy was still lower than that of the manual technique and it was not applicable in the clinic (10-12). Studies that have used the hybrid approach consist of studies by Liu in 2000 (mean error = 2.86) and Yue (2006), which did not exhibit sufficient accuracy for use in the clinic (5, 13). In research and in the orthodontic clinic, the total error in the X and Y coordinates are considered acceptable accuracy at 0.59 and 0.56, respectively. Therefore, considering the advantages mentioned above for the lateral cephalometric analysis using the automatic technique and considering the existing problems, we decided to use a new technique to determine the landmarks in the present study, which is in fact the main challenge of the automatic technique. In previous works, since there was insistence on the use of edge-based algorithms, unfortunately good results were not achieved for points that were not located at the edges or near the edges. Therefore, we used the template matching technique to eliminate dependence of the algorithm on edges. In this technique, a specific anatomic area was considered for each landmark, which was different from the other landmarks so that the machine could directly refer to the areas in question to determine the points and determine each point. In the present descriptive study, the sample size was calculated at 110 by considering a sensitivity rate of 80% between the manual and software techniques, with α = 0.05 and a study power of 80%. The sensitivity was decided on based on the opinion of the researcher. To this end, 110 lateral cephalograms were selected to determine the anatomic areas and the diagnostic value of the software program. 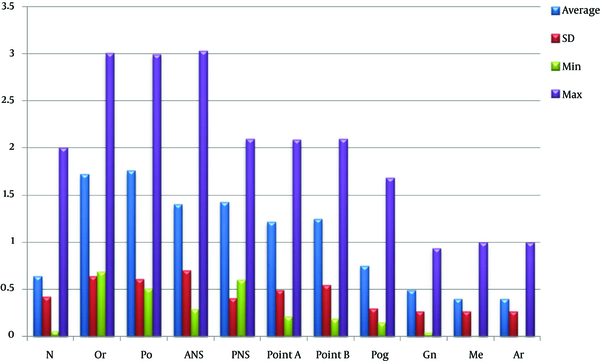 The digital lateral cephalograms of patients referring to Parto oral and maxillofacial radiology center in Tabriz, Iran, from 2011 to 2014 were selected randomly. First, the cephalograms underwent a pre-processing procedure to achieve images with no differences in size and resolution. In each image, first the resolution was set at 96 dpi and the image size was adjusted at 2700 × 2016. Such a procedure was necessary to match all the images and prevent disturbances in calculations. After random selection of 110 digital cephalogram and a pre-processing procedure, three orthodontists determined 11 cephalometric landmarks on these images manually using a software program designed to this end. Kappa coefficient was used to evaluate agreement between the three orthodontists, which was calculated at 0.79. The eleven landmarks used in this study consisted of the following: Ar, Me, Gn, Pog, point A, point B, PNS, ANS, Po, Or and N. In this software program, in order to select each landmark, a part of the cephalogram was set and the landmark in question was selected on it. All the image pieces were set side by side and the coordinates of the selected points were saved in the database for the corresponding procedure of the images. SIFT algorithm was used in this software program for the automatic identification of the landmarks. SIFT algorithm is one of the techniques that has been used to date for the automatic identification of landmarks. This algorithm is a corresponding strategy based on characteristics that have been introduced for identification of patterns in visual images; it consists of two principal stages: extraction of characteristics and creation of a describer (14). After completing the software program with the use of these data, 30 new cephalograms were submitted to the software program for the automatic determination of the points. These 30 cephalograms were analyzed manually by three orthodontists in order to evaluate the accuracy of the software program. Data were analyzed with SPSS 16. Paired t-teat was used to compare the manual and computerized techniques. Statistical significance was set at P < 0.05. Table 1 and Figure 1 compare the means, standard deviations, minimums and maximums of the errors of the landmarks. In the present study, 140 cephalograms were evaluated; 110 cephalograms were used for learning and creating patterns and the necessary cases and 30 images were randomly used to test the designed algorithm. Figure 1. The Means, Standard Deviations, Minimums and Maximums of Differences Between the Manual and Automatic Techniques in Each of the Landmarks Evaluated. - Evaluation of point N showed that in 2 lateral cephalograms the difference between the two techniques was > 2 mm, with differences of 1 - 2 mm and < 1 mm in 2 and 26 cephalograms, respectively. - Evaluation of point Or showed that in 2 lateral cephalograms the difference between the two techniques was > 3 mm, with differences of 2 - 3 mm, 1 - 2 mm and < 1 mm in 8, 13 and 7 cephalograms, respectively. - Evaluation of point Po showed that in one lateral cephalogram the difference between the two techniques was > 3 mm, with differences of 2 - 3 mm, 1 - 2 mm and < 1 mm in 9, 15 and 5 cephalograms, respectively. - Evaluation of point ANS showed that the difference between the two techniques was > 3 mm in 3 lateral cephalograms, with differences of 2 - 3 mm, 1 - 2 mm and < 1 mm in 4, 11 and 12 cephalograms, respectively. - Evaluation of point PNS showed that the difference between the two techniques was > 2 mm in 5 lateral cephalograms, with differences of 1 - 2 mm and < 1 mm in 18 and 7 cephalograms, respectively. - Evaluation of point A showed that the difference between the two techniques was > 2 mm in 4 lateral cephalograms, with differences of 1 - 2 mm and < 1 mm in 13 and 13 cephalograms, respectively. - Evaluation of point B showed that the difference between the two techniques was > 2 mm in 12 lateral cephalograms, with differences of 1 - 2 mm and < 1 mm in 16 and 7 cephalograms, respectively. - Evaluation of point Pog showed that the difference between the two techniques was > 2 mm in one lateral cephalograms, with differences of 1 - 2 mm and < 1 mm in 5 and 24 cephalograms, respectively. - Evaluation of point Gn showed a difference of 1 mm in all the cephalograms between the two techniques. - Evaluation of point Me showed that the differences between the two techniques were 1 - 2 mm and < 1 mm in 2 and 28 cephalograms, respectively. - Evaluation of point Ar showed that the differences between the two techniques were 1 - 2 mm and < 1 mm in 2 and 28 cephalograms, respectively. Furthermore, based on the analyses carried out, except for points Or, Po and PNS, the differences in the landmarks evaluated were not statistically significant between the two techniques (P > 0.05). The overall results of the present study showed that the differences between the manual and automatic techniques in relation to determination of cephalometric landmarks were < 1 mm, < 1.5 and < 2 mm in 46%, 82% and 100% of the cases, respectively. Parthasarthy (15) applied a software program that used the edge-based technique to determine points and reported that 18%, 58% and 100% of the points were determined with errors of 1 mm, 2 mm and 5 mm, respectively. Two orthodontists evaluated the landmarks in that study and evaluations were carried out on 5 radiographs with varying qualities and 9 landmarks, 5 of which were the same as those evaluated in the present study. The reference point for evaluation by the software program was considered an error region in 3 pixels around each landmark. Therefore, due to the difference in the reference point, the number of radiographs and the points used between the two studies, it is not possible to directly compare the results between that study and the present study; however, the software program in the present study showed higher percentages, which is due to the use of more radiographs compared to that study. Partrasarthy did not explain whether the 5 lateral cephalograms used were new cephalograms or the same cephalograms that were used to design the software program. Such a matter will have a significant effect on the results because if the same images that were used for designing the software program are used again, better results would be achieved compared to the situation in which a new set of images are used. Tong et al. (16) evaluated 5 lateral cephalograms and showed that 45% of 26 landmarks were determined with an error of 1 mm, and 70% and 95% were determined with errors of 2 mm and 5 mm, respectively. Huton et al. (17) designed a software program, in which the ASM (Active Shape Model) system was used to determine landmarks and then evaluated the software program with the use of drop-one-out technique, i.e. of 63 radiograph used in designing the software program, in each stage one radiograph was used as an evaluation radiograph and the remaining 62 radiographs were used as a group used in the algorithm. The disadvantage of this technique was the use of radiographs utilized in the evaluation during the initial designing of the software program. The results showed that 13% of 16 landmarks were determined with an error of 1 mm, and 35% and 75% were determined with errors of 2 mm and 5 mm, respectively. In a study by Shahidi et al. (4), the accuracy of a software program in determining the cephalometric landmarks was evaluated and it was reported that of 16 landmarks evaluated on 40 cephalometric radiographs, 12.5% exhibited errors less than 1 mm and 43.75% had errors less than 2 mm. The overall mean error between the manual and automatic techniques in determining landmarks was reported to be 2.59 mm. In that study, too, similar to the present study, three orthodontists determined landmarks on digital cephalograms. In contrast to the study by Shahidi et al. in the present study the errors of the two techniques in all the landmarks evaluated were < 2 mm and more cephalograms (110 images) were used to prepare the software algorithm. Based on the results of statistical analyses, there were significant differences in determining Or, Po and PNS points between the two techniques (P > 0.05). It should be explained that in the manual technique, too, carried out by three orthodontists, it was difficult to determine these points and kappa coefficient between the measurements carried out by these three orthodontists was < 0.75. In the present study, with the application of the algorithms, all the points were determined and the results are presented in Table 1. The results showed that the designed algorithm exhibited proper performance in determining both the easy and relatively difficult points; it also exhibited relatively acceptable performance with very difficult points and was better than other algorithms in determining these points. Therefore, considering the capabilities of this technique, the accuracy of this technique will increase with an increase in the number of the initially evaluated images and the landmarks for the learning process, making it an alternative technique for the manual technique. In addition, the type of the radiographic images used, too, is very important and better results will be achieved with an increase in the quality of the images. However, considering the capabilities of SIFT algorithm, the errors in low-quality images, too, is at a standard level and it can be used for analyses. Based on the results, it is obvious that the designed algorithm performed well in easy and relatively difficult landmarks and exhibited rather acceptable performance in very difficult points and was better than other algorithms. The authors would like to thank Tabriz University of Medical Sciences for financial support.